This Motivation Monday brings us four days closer to that fun, candy-filled celebration known as Halloween. If you’re still trying to figure out how to score that sold-out Frozen costume for your kid or what you’re going to wear to that grown-up holiday party, I figured I’d throw in a few reminders about how to manage the tricks and treats without slipping into a candy coma. Going to extremes: Buy candy you DON’T like. Since I’m a chocolate nut, buying fruity candies like Skittles or Starbursts is an easy way for me to avoid finding too many wrappers in my trash on November 1st. You can also hand out sugar-free gum. At about five calories per stick, if you chew on a few of those during the holiday, it’s obviously not going to blow your healthy eating habits to smithereens. Mini Three Musketeer Bars: Three minis register at 24 calories each and less than one gram of fat. Hershey Kisses: Three chocolate smooches register at 67 calories and 4 grams of fat. Tootsie Roll: One piece has 26 calories and five grams of fat. 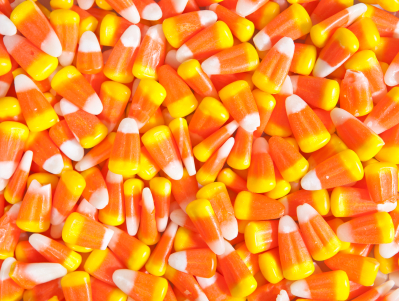 Candy Corn: You can enjoy a handful of 10 pieces for only 64 calories and 0 grams of fat. 100 Calorie Packs: A good alternative to candy bars, these individual packs can satisfy your sweet tooth and take the guess-work out of portion control. I wrap up by wishing everyone a safe and Happy Halloween! Remember, even this sweet holiday doesn’t have to put the brakes on your never-ending quest to have fun, be fit and feel fabulous! Posted on October 27, 2014, in Fitness, Health, Nutrition and tagged Candy & Calories, Chocolate, Healthy Halloween, Laura DeAngelis, Motivation Monday, Tips for Guilt-Free Halloween, Trick or Treat. Bookmark the permalink. Leave a comment.